Mary and Jesus surrounded by shepherds. 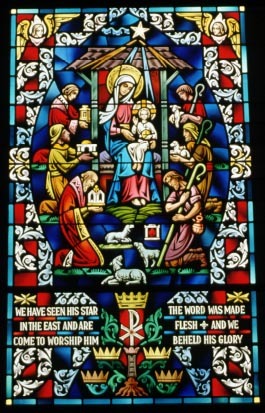 Entitled "The Adoration of the Magi", this window portrays central figures in the Christmas story: Mary and the child Jesus, surrounded by shepherds with their sheep, and wise men from the East presenting their gifts of gold, frankincense and myrrh. It was made in 1959 by the T. C. Esser Co. Stained Glass Studios of Milwaukee, Wisconsin, for St. Mary's Chapel at historic St. Mark's Episcopal Church in Grand Rapids. St. Mark's Church was founded in 1836 and the core of its present building erected in 1848. The Chapel was added in 1872. Established at the turn of the century, the Esser company continues to operate under the name of Oakbrook-Esser Studio at Oconomowoc, Wisconsin. St. Mark's Church of Grand Rapids was registered in the Michigan Stained Glass Census by Jean Heibel of Belmont. Text by Betty MacDowell, Michigan Stained Glass Census, December , 1997.